Click on each section below to learn more about how to prepare for emergencies. Each person, business, and family should have a plan in case disaster strikes. You may not have time to prepare before an incident. Developing and practicing your emergency plan with your family keeps everyone on the same page. The resources below will help you develop your emergency plan. How will you be notified of emergencies? Sign up for AlertHouston, and have multiple ways to stay informed about emergenceis in your area. A safe place, such as a neighbor's house, mailbox, park etc. in your neighborhood in case en emergency occurs in your home. A rally point somewhere in another part of the city, in case you are unable to get back to your neighborhood. Consider a family member or friend's house. A family member or friend's house outside of the City, in case a catastrophic emergency means you cannot remain in, or return to the City. Make sure everyone has this person's phone number written down as well. Designate a shelter-in-place room in your home. This should be an interior room with few doors and no windows (like a closet or bathroom). You may be required to shelter-in-place during severe weather, during a hazardous materials incident, or in a law-enforcement situation like an active shooter. Make sure you have a Shelter-in-Place kit that has plastic sheeting and duct tape, in case a hazardous chemical emergency requires you to seal yourself in your shelter-in-place room. Make sure everyone has written important phone numbers down. If mobile phone batteries die, you may need these written down instead. Make sure every family member is "connected" on social media - this might be an easy way to check in on each other. Make sure each family member knows how to "text" - oftentimes, when phone lines are down, text messages are able to get through. Designate an out-of-town relative or friend to be the "check-in" person. Sometimes, its easier to call or contact someone outside of the area that's been affected by an emergency. Emergencies can happen anytime - so be aware of your surroundings when you're away from home, and be prepared to take action. Identify emergency exits when you go to public places, such as malls, community centers, restaurants, shops, and places of worship. Instruct children what to do, and where to go if there is an emergency and you become separated. Know the emergency plans for your children's school, your workplace, and place of worship. Know what to do if services or business is suspended due to an emergency, and what kind of communication to expect from authorities in those places. How you would get a hold of each other after an emergency. What you would do if a hazardous chemical emergency happened and you had to shelter-in-place. What should be in your emergency kit? Who should you plan for? What resources are out there to help me make sure that I don't miss something while packing it? All of these are very good questions. The links below will help you put together a family emergency kit, with all the necessary supplies to be ready for whatever type of emergency. Water (one gallon per person per day, for drinking and sanitation—up to a 7-day supply). Non-perishable food (up to a 7-day supply per person). Battery-powered radio (with extra batteries) or hand-crank radio. Weather radio with tone alert and extra batteries. Filter mask or cotton t-shirt, to help filter the air. Moist towelettes, garbage bags, soap, disinfectant, and plastic ties for personal sanitation. Wrench or pliers to turn off utilities (water and electric). Manual can opener if your kit contains canned food. Plastic tarps for emergency roof repair. Items for unique family needs, such as daily prescription medications, infant formula, or diapers. Mess kits, paper cups, plates, and plastic utensils. Rain gear, sturdy shoes, long pants, and gloves. Important family documents such as copies of insurance policies, identification, birth certificates, passports, and bank account records in a waterproof, portable container. A stuffed animal or toy for your child and something to help occupy their time, like books or coloring books. If this includes a hand-held video game, make sure you have extra batteries. Make sure your Shelter-in-Place Kit has everything you need ahead of time. Shelter-in-Place orders are issued when it is safer for you to be sheltered indoors than for you to evacuate. Get underneath a sturdy table or object and hold on. If you or your children have a bicycle helmet, put that on your/their head. Use plastic sheeting and duct tape to create cover all doors, windows and vents in the space with at least two inches of space around the edge. Turn on a battery-powered radio and tune it to local radio or use your smartphone to find information from official sources (such as houstonemergency.org). DO NOT open your door for ANYONE unless they show proper law enforcement identification. A "Go-Bag" will ensure you have what you need in the event you have to quickly leave your home. Make sure these supplies are already put together and in an easily-accessible place. In some emergencies, you may only have seconds to grab your supplies and leave. Copies of your important papers in a waterproof bag. Bottled water and snacks such as energy or granola bars. First-aid supplies, flashlight, and whistle. Battery-powered or hand-crank radio (with extra batteries, if needed). A list of the medications each member of your family needs and at least a 14-day supply of each medication. Toothpaste, toothbrushes, wet cleansing wipes, and so on. Contact and meeting place information for your family and a map of your local area. External mobile phone battery pack or solar charger. Some hand-crank flashlights will also include a phone charger. Escape Tool for your car. Supplies, such as catheters, medications, syringes, incontinence supplies etc. When emergencies happen in neighborhoods, the City uses a variety of tools to communicate with those affected. The Greater Harris County 911 Network operates the 911 Emergency Notification System (ENS) which will pulse out a phone call to all landlines in a specific area. Additionally, for those without landlines, the system allows you to opt-in to receive the call on your mobile or digital phone, as well as receive the message as an SMS Text and Email. For more information, or to register your mobile or digital phone, visit 911.org. Visit houstonemergency.org for up-to-date information on emergencies when they occur in Houston. This site also has links to weather, energy restoration, traffic and other emergency information during times of crisis. Houston's local radio and television stations play a key role in helping inform residents about emergency situations. Houston's two local Emergency Alert System (EAS) stations are KUHF 88.7FM and KTRH 740AM. They will receive information first, and then it will be pulsed out to all other radio and television stations in our area. Wireless Emergency Alerts (WEA) are sent by authorized officials when life-threatening situations are occurring. These include severe weather warnings, such as Tornadoes, Flash Floods and Hurricanes. Local authorities, including the City of Houston, have access to this system to help broadcast short, important messages to local residents. Make sure your phone is set to receive WEA messages. You have the ability to opt-in or out of AMBER alerts and Emergency Alerts. Please, at the very least, ensure that Emergency Alerts are active on your phone. Contact your phone carrier if you have problems accessing these settings on your device. Communities are a key element to how well people respond to disasters. Having a prepared community around you will help you be able to better respond to a disaster and recover faster. Take a role in your community and lead how they respond. 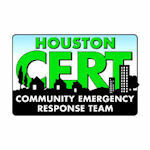 The CERT training program is designed to fit into community members' ordinary schedules. The training is divided up into eight three-hour modules. During that time, trainees will have classes on the National CERT program, the organizational structure used by government agencies in disasters, basic first aid techniques, basic search and rescue techniques, and ways to ensure that the individual trainee and his or her family members are prepared for a disaster. Classes are taught by local professionals who have experience in the units they instruct. The courses are managed by a lead instructor who has undergone a Train-the-Trainer program which meets the FEMA and CERT standards. All CERT training is provided free-of-charge. Visit houstoncert.org for details. The Ready Houston program offers a 90-minute training class called "Neighborhood Ready," which is facilitated by a member of your community. The course covers topics such as determining if you and your neighbors are ready, understanding what disasters could affect your neighborhood, making a plan, building a kit, knowing your neighbors, and staying informed. Visit neighborhood.readyhoustontx.gov for information.